ST. PAUL, MN—Evidently shocked by on-screen events to the point of committing spontaneous breaches of filmgoing etiquette, a man at a Twin Cities showing of A Star Is Born repeatedly annoyed his fellow moviegoers by screaming “Get out of there, you idiot!” every time Bradley Cooper’s character appeared on the screen. “Oh God, oh God, oh God—no!” the man said in an apparent attempt to warn Jackson Maine, the successful but self-destructive rockstar portrayed by Cooper in his directorial debut, of some sort of threat presumably posed by the unknown but incandescently talented singer–songwriter Ally (Lady Gaga), seemingly completely unaware he was disturbing and distracting his fellow filmgoers. “No! Don’t pick up the guitar! You idiot, that’s exactly what she wants you to do! Just run away! 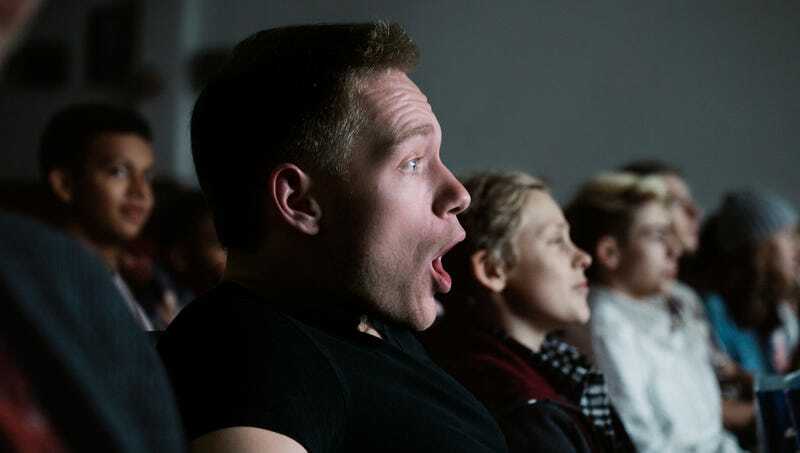 Run!” Theater employees later escorted the man from the premises after he showered all viewers within 10 feet of him with the contents of his popcorn bucket upon seeing Ally and Jackson sharing a spontaneous kiss.